The Blade is a massive battleship in Super Mario RPG: Legend of the Seven Stars. He resembles a giant ax, with a great eye in the middle of the main blade. Additionally, two smaller axes hang from the side of him. Blade's main weapon is a massive energy cannon that can fire the powerful Breaker Beam. Blade is first mentioned by one of Smithy's minions, Yaridovich. Apparently, he was supposed to rendezvous with Yaridovich once he had his hands on the fifth Star Piece, but Blade did not meet at the predetermined time for unknown reasons. Jonathan Jones' pirates briefly saw Blade while Mario and Yaridovich were fighting before ultimately having to return to the sea, to which he mentioned in a note to Mario. Later, when the Axem Rangers swipe the sixth Star Piece away from Mario inside Barrel Volcano, he arrives outside with slight tardiness. Mario manages to follow the escaping group by simply leaping onto him, leading to a battle on the deck. Once each Axem Ranger is defeated by Mario and company, Axem Red activates the main cannon of the battleship, allowing him to fire the Breaker Beam at Mario's party. At the end of the battle, the cannon overloads, and Blade explodes in a magnificent fashion. During the parade of Super Mario RPG: Legend of the Seven Stars, Smithy can be seen riding on the damaged Blade. Smithy's factory administrators all wield large axes that look like Blade. 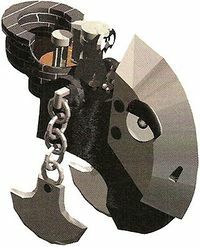 Blade bore several similarities to the Air Force boss from Final Fantasy VI, specifically being a large airship with a face at the front, a laser gun, as well as having an overall similar build. In the Japanese version, Blade even had a similar name to Air Force. Both Super Mario RPG and Final Fantasy VI were developed by Square. This page was last edited on March 5, 2019, at 13:48.